Our delicious FELIX® GOODY BAG Seaside Mix with Salmon, Pollock & Trout are the ideal treat for fish lovers. With a tasty combination of three delicious fish flavours, these tasty snacks are triple the treat! Our cat treats have been specially developed to ensure they are full of flavour with a tasty, crispy crunch in every bite. We're sure your cat will love these yummy snacks that are perfect at any time of day. We use a combination of nutrients including vitamins to help keep your cat healthy and happy. Flavoured with salmon, pollock and trout for even more irresistible flavour. Mouth-watering flavours and crunchy textures packed in a convenient bag for your cat to enjoy. A yummy complementary pet food your cat will love morning, noon and night! With three irresistible flavours in every bag, they're Triple the Treat! Our delicious FELIX® GOODY BAG Seaside Mix flavoured with Salmon, Pollock & Trout are the ideal treat for fish lovers. With a tasty combination of three delicious fishy flavours, these tasty snacks are triple the treat! Our cat treats have been specially formulated to ensure they are full of flavour with a tasty, crispy crunch in every bite. We're sure your cat will love these yummy treats that are perfect at any time of day. 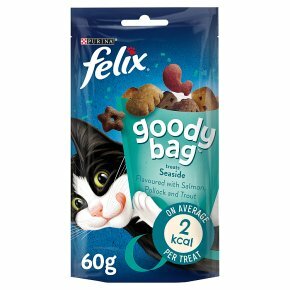 FELIX® GOODY BAG Seaside Mix cat treats flavoured with Salmon, Pollock & Trout include triple the flavour for triple the treat! Shake the bag and watch your cat come running to try our tasty treats. Each bag is bursting with flavours and exciting aromas to tempt your cat. Available in convenient, handy pouches to make snack time even easier. With proteins, vitamins and minerals to help keep your cat supported.